There’s no chance of a new Richter Pictures here. This is the well-known 1956 Prague performance which itself is by no means the best-remembered of the many surviving examples, led inevitably by the bronchial audience in Sofia in 1958. This Czech recording was taped two years earlier. Not only are there no new additions to the discography there are no interpretative surprises from a recording that is very familiar to Richter collectors. It’s a touch longer than the earlier October 1952 Moscow reading, less frenzied and note-dropping than the later Sofia one but very much cast in the same kind of mould. There’s a touch of tape damage in ‘The Old Castle’, and maybe the piano misbehaves from time to time but the perfectly realised, superbly characterised ‘Bydlo’ and the utterly purposeful last Promenade – has anyone else been quite so consistently purposeful in the Promenades as Richter? - all point to a classic performance. Vertical depth in ‘Catacombs’, ochre and sepulchral, lead onto a sweeping ‘Hut on Fowl’s Legs’ and the immense sonorities of the ‘Great Gate’ itself; after which the piano sounds ready to beg for its life. Tchaikovsky’s Grand Sonata in G has never held much of a foothold in the repertoire. This December 1954 recital is the earlier of the two Richter performances around (and it pre-empts the commercial LP by a couple of years). It is full of powerful poetry and genuine sensitivity. This transfer is brighter but clangier than that on Parnassus in its multi-volume Richter series (see review). 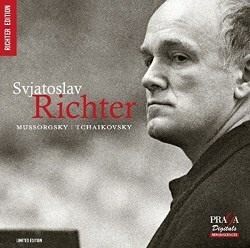 Richter enjoyed playing the same quartet of pieces from the Tchaikovsky’s The Seasons, for which Praga has selected the 1960 New York reading. He chose May, June, November and January in that order. He doesn’t seem materially to have altered his approach to them as in his 1983 Bavarian Radio performance, released on Ariola Eurodisc, tempi were as similar as to make no difference and he brought similarly affectionate tonal allure to bear. Choosing the Troika of November as the scherzo allows him to present a sonata-seeming work. As ever he plays most sympathetically and beautifully. This SACD doesn’t sound especially resplendent but then we are talking about vintage live recital material.